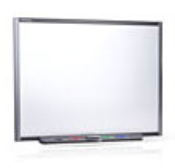 Discover an integrated system with unparalleled image quality and a large interactive surface. The 685ix is one of the world's first integrated systems to combine an ultra-short-throw projector and a widescreen interactive whiteboard. Bring technology to your classroom with a selection of products that are interactive, integrated, easy to use and proven to improve student learning outcomes. The SMART Interactive Classroomhelps you turn your teaching space into a technology-enabled environment where you can easilyhelp students collaborate and succeed. Extend your interactive capabilities with a flexible pen-and-finger system – the SMART Board 600 series interactive whiteboard delivers intuitive performance and legendary ease of use. This classroom amplification system distributes sound evenly throughout the room, so students can hear clearly, no matter where they’re sitting. SMART Audio includes speakers, wireless teacher and student microphones, a receiver and sensors.